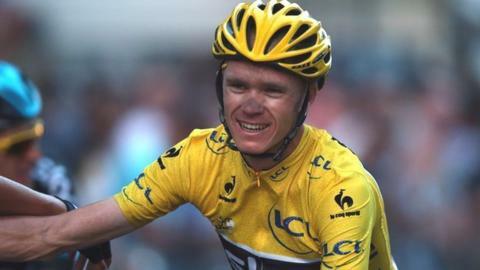 Chris Froome will be one of 10 Britons in this year's Tour de France, which begins on Saturday. The 2013 winner will be joined on the Team Sky roster by Geraint Thomas, Ian Stannard, Luke Rowe and newly crowned British champion Peter Kennaugh. Alex Dowsett will ride for Movistar while Mark Cavendish has been named in the Etixx - Quick-Step team. Twins Adam and Simon Yates are in Orica GreenEdge's squad, with Steve Cummings riding for MTN-Qhubeka. It equals the record for the biggest British contingent in the Tour, set in 1955, and is a big increase on the four Britons who started the 2014 race in Yorkshire. "Last year's disappointment is this year's motivation for Team Sky," said Froome, 30. "From the moment I crashed out in 2014 I've had the burning desire to get back to this year's Tour in the best possible shape." Team principal Sir Dave Brailsford said Froome was "hitting form at just the right time". "He's in good shape, he's healthy, he's relaxed, he's strong mentally as well," said Brailsford. "So I think we are happy. I don't think we could be in a better position as we are now." The Team Sky line-up is completed by Australian Richie Porte, Ireland's Nicolas Roche, Dutch rider Wout Poels and Leopold Konig of the Czech Republic. Saturday's opening stage will see the riders take part in an individual time trial around the Dutch city of Utrecht. The race will end on 26 July in Paris.